One of the best ways to enhance your final images is to apply some post- processing work with the help of image manipulation software like Photoshop and basic rendering applications. 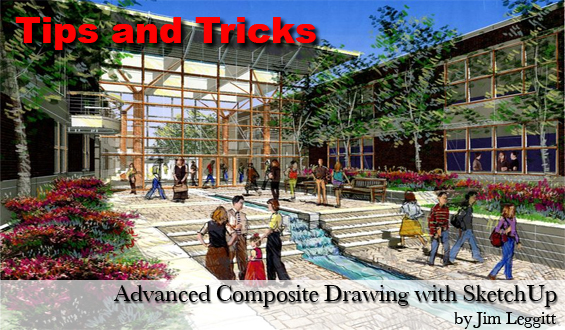 You will find some intermediate and advanced SketchUp modeling tutorials as well, to drive your modeling skills to a new level. 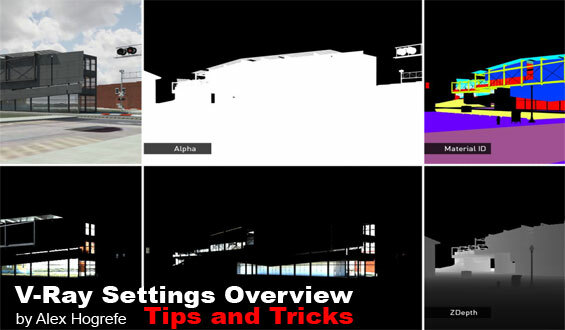 Treat this area as a library of useful ideas and methods for post-processing and modeling. Come back and have a go at them when you need to. We will also feature some of the most popular modeling, animation and rendering packages available in the extremely challenging and creative world of 3D modeling. We are certain that these tips and tricks will greatly improve your skills and your final presentations. Dig deep, there are few real gems here! 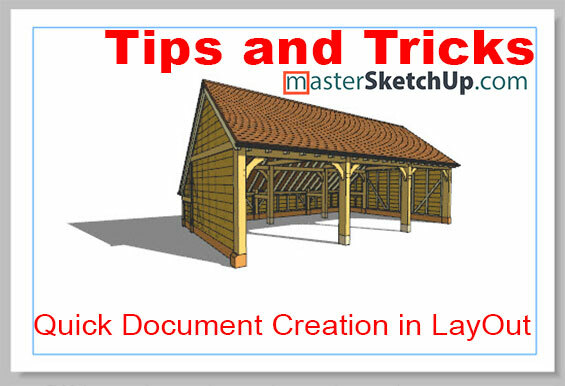 In this article, we’ll go over how to create a basic LayOut document without any preparation in SketchUp. If you are installing floor tile, you need to carefully plan the layout so you know where all of your cut pieces are going to land. You don’t want to just randomly start at one wall, only to find that you need to install a 1/2″ sliver of tile once you get to the other side. 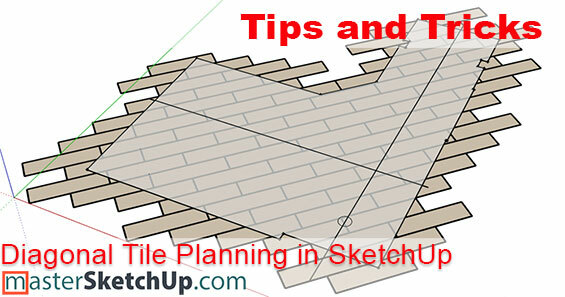 SketchUp is a great tool for visualizing and planning complicated floor tile, to ensure cut pieces are sized well. You can also get an accurate material count, including accountability for tiles that will be used from cutoffs of others. 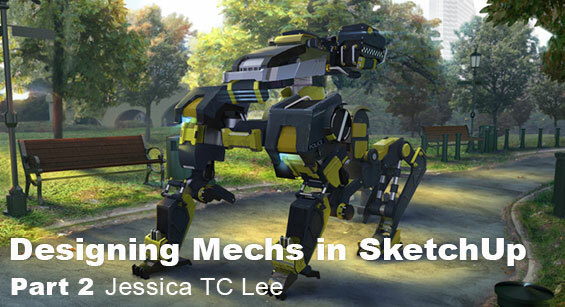 In this tutorial, we will learn about how to complete a portfolio piece of a mech design in SketchUp, KeyShot and Photoshop. 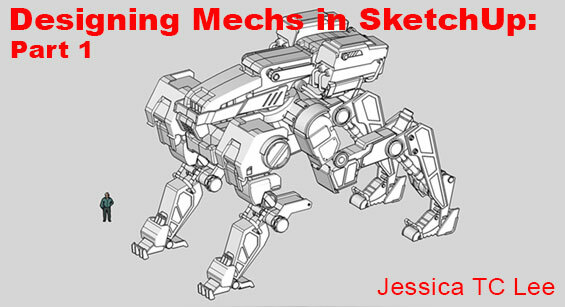 In this tutorial, we will learn how to complete a portfolio piece of a mech design in SketchUp, KeyShot and Photoshop. 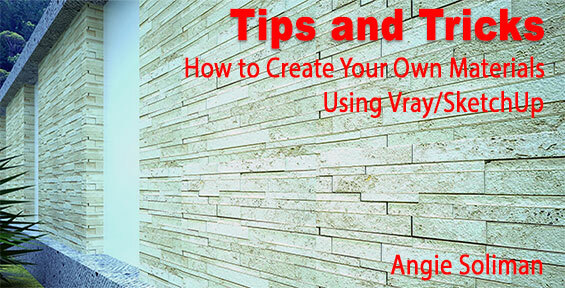 How How to Create Your Own Materials Using V-Ray and SketchUp by Angie Soliman – a pretty simple procedure that requires intermediate skills in image editing, SketchUp, and V-Ray. 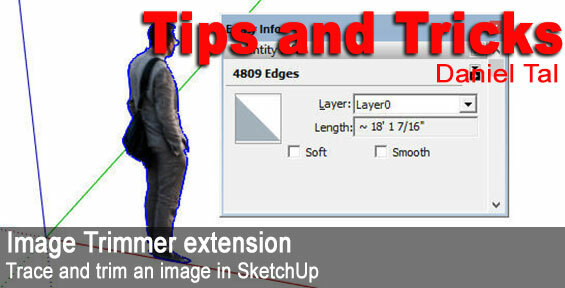 Image Trimmer Extension – Part 1 Trimming – trim png images in SketchUp using this free extension. 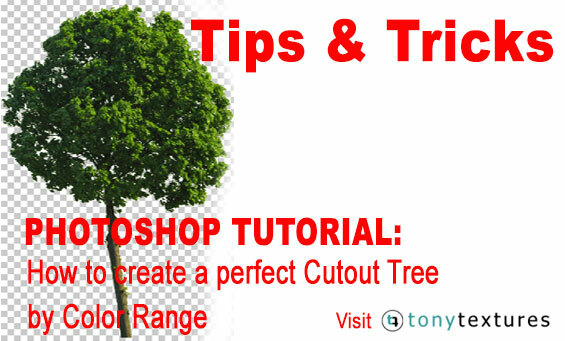 How to Create a Perfect Cutout Tree via Color Range by tonytextures – This tutorial will show you how to create a perfect cutout tree in Photoshop. Here Alex shows you how he composes perspective shots. After Part 1, Daniel goes a little deeper, showing a few dos and don’ts. 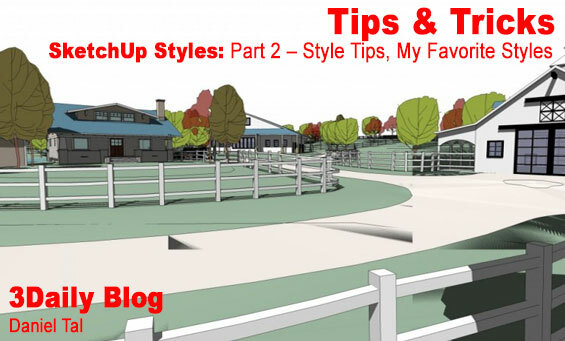 These are some some tips on how the pros use Styles. 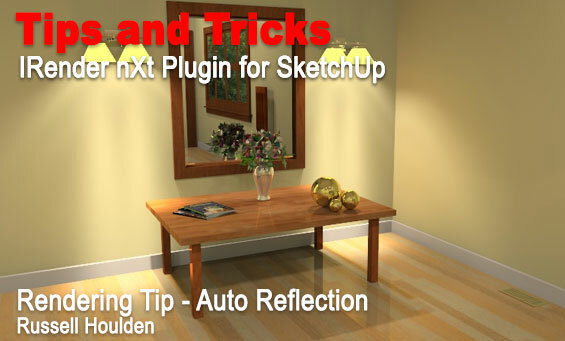 Rendering Tip – Auto Reflection by Russell Houlden – There are quite a few very useful features in IRender nXt with advantages that aren’t necessarily obvious. 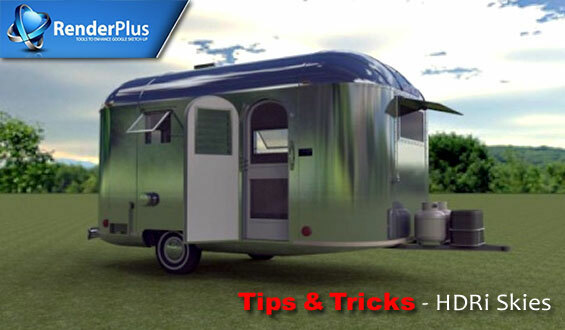 Russell Houlden gives you some tips on using “Auto-Reflection”. 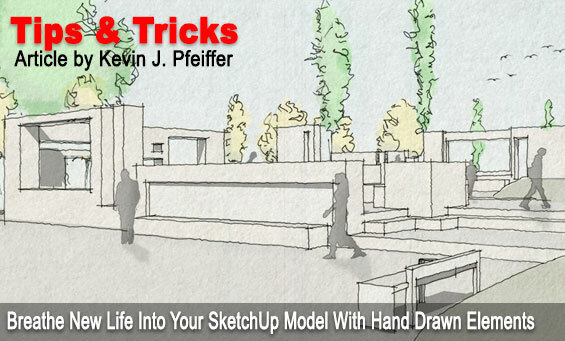 How To Breathe New Life Into Your SketchUp Model With Hand Drawn Elements by Kevin J. Pfeiffer – We take a look at how to take your lifeless SketchUp models and inject with a new lease of life. 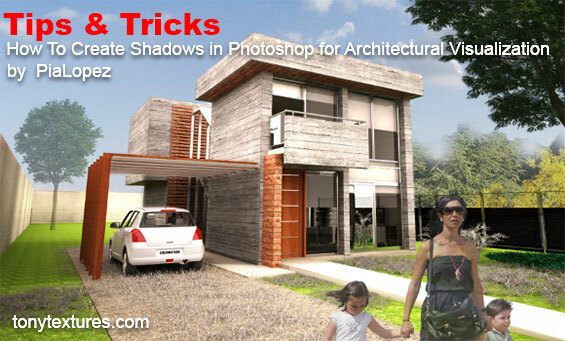 How to Create Shadows in Photoshop for Architectural Visualization by PiaLopez – You want to create shadows in Photoshop for your next architectural presentation? Here are some some key points. V-Ray Settings Overview by Alex Hogrefe – This is an overview of the basic concepts that Alex uses for setting up a daytime rendering scene. 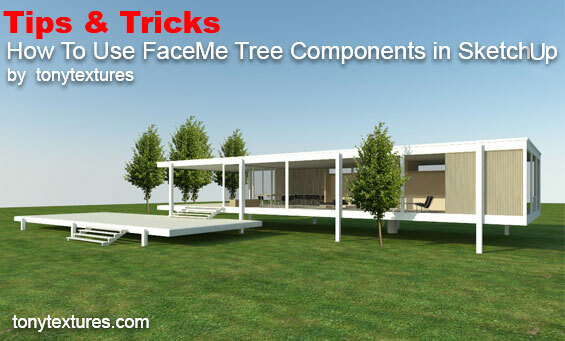 How to Use FaceMe Tree Components in SketchUp by tonytextures – In this tutorial you will learn how to use 2d vegetation images as faceme components in SketchUp. 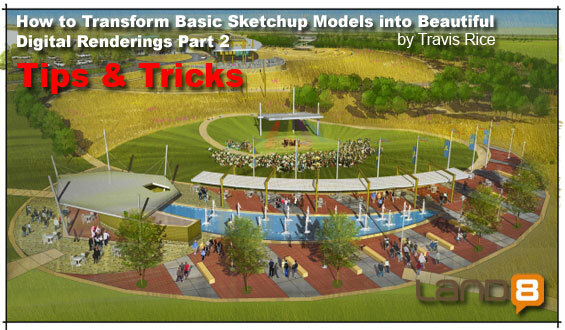 How to Transform Basic SketchUp Models into Beautiful Digital Renderings part 2 by Travis Rice – In this second tutorial about enhancing basic SketchUp views I want to show how, with minimal effort, you can take a flat, uninspiring, initial 2d export from SketchUp and create a drawing with depth that does more than just sell an idea but also tells a story. 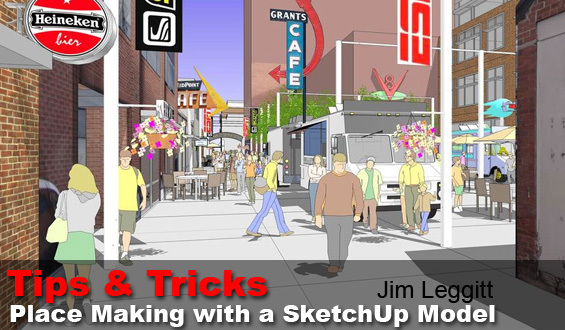 Place Making with a SketchUp Model by Jim Leggitt – Jim constructed the SketchUp model which revealed a series of alternative alley uses, shadow studies and eye-level views. More great tips from Jim! 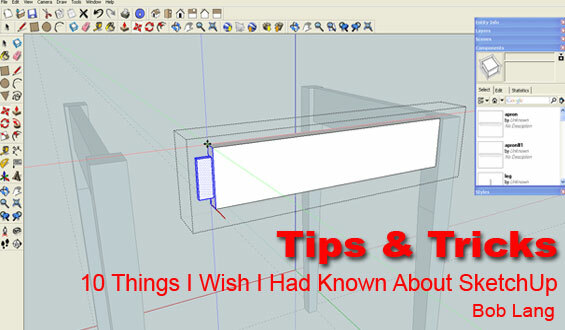 10 Things I Wish I Had Known About SketchUp by Bob Lang – 10 Things About SketchUp from published author and woodwork specialist Bob Lang… improve on your modeling skills with these great basic tips from Bob. 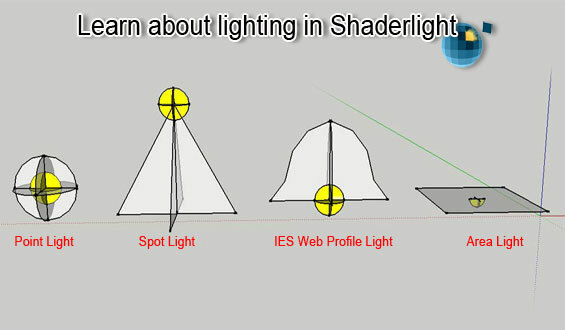 Learn About Lighting in Shaderlight by Shaderlight Team – The right lighting can make or break your render. To give you a helping hand, here’s a quick overview of the different types of artificial lights in Shaderlight and the best way to use them. 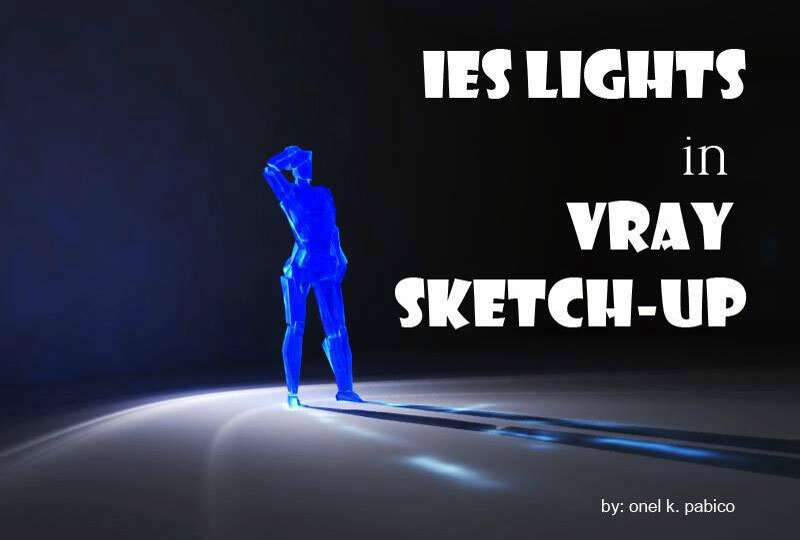 Setting up IES Lights in V-Ray for SketchUp by Onel Pabico – In this mini-tutorial, Onel Pabico shows you how to set up your IES lights in V-Ray for SketchUp, includes some simple tips for adjusting the amount of light generated from your lights by changing the Unit type. 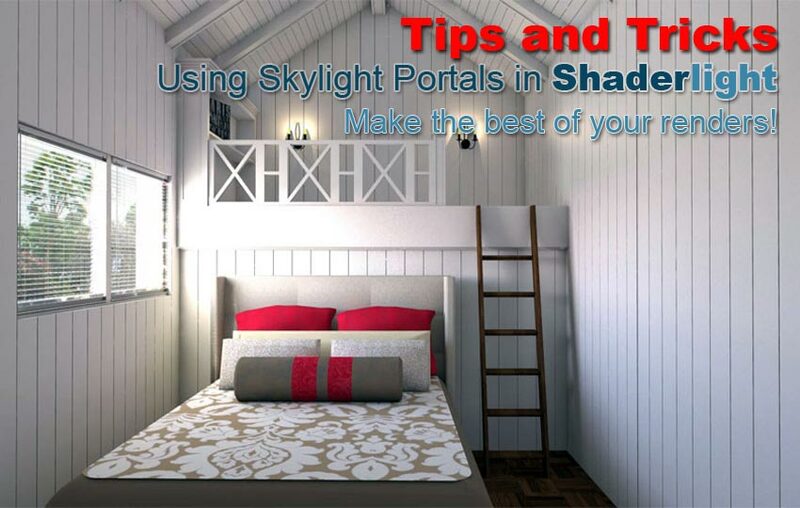 Using Sky Light Portals in Shaderlight by Shaderlight Team – We often see these questions in support so we have put together this quick tutorial which should hopefully give you all the answers and help you make the best of your renders! 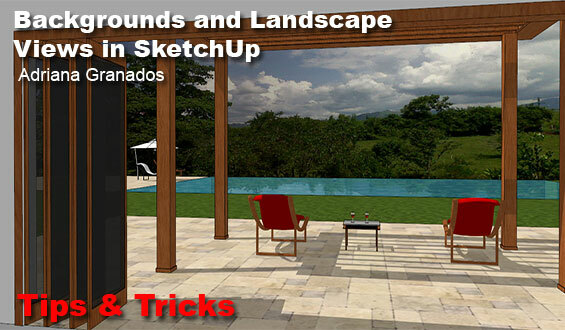 Backgrounds and Landscape Views in SketchUp by Adriana Granados – How to place a jpg as a sky or environment background inside SketchUp model. 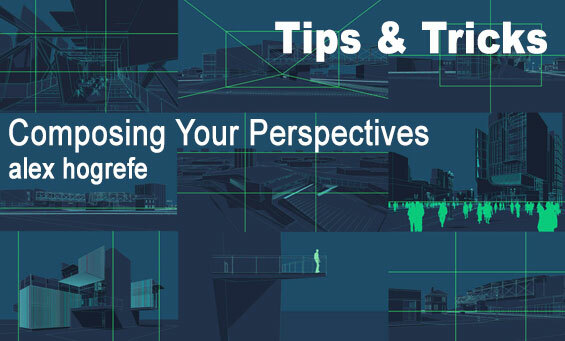 Many know adding a background to your SketchUp model allows you add image files to your model and position images such that they act as a background. 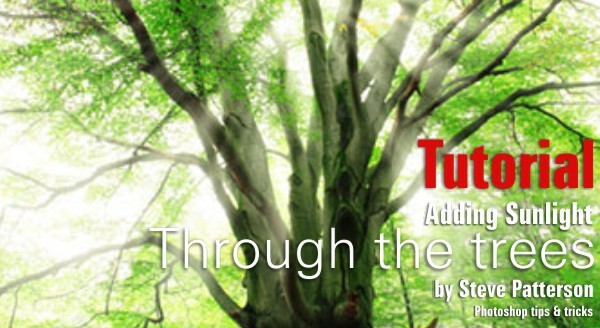 Adriana has some tips to share with us which will help in your daily workflow. 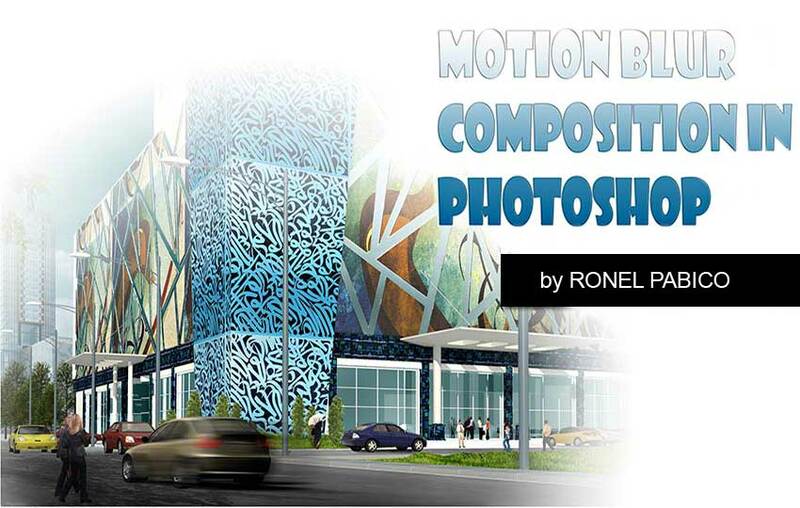 Motion Blur Composition in Photoshop by Ronel Pabico – Ronel Pabico shows you how to add some motion to a static car in his rendered image using the Motion Blur Filter in Photoshop. 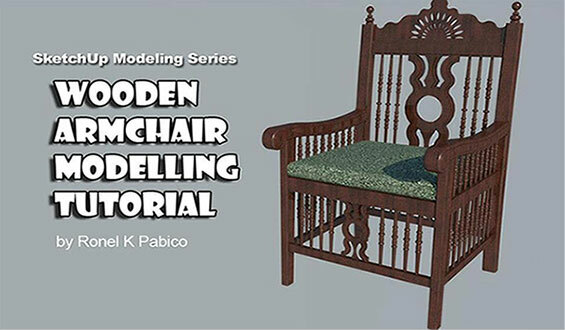 Wooden Armchair Modeling Tutorial by Ronel Pabico – Great little tutorial on modeling a Spanish style wooden single seater chair by Ronel Pabico. With the basic parts modeled you can use them to expand the collection. 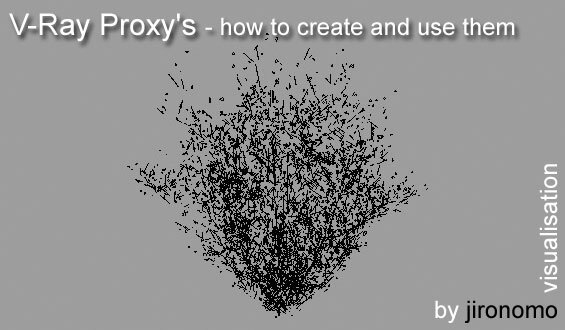 V-Ray Proxy’s – how to create and use them by Jeronomo Visualisation – You are shown how to create a simple V-Ray proxy of a plant that you can then merge into other scenes with material already applied. The key to being able to import your proxy with the materials applied and on the correct geometry is in the way that you both create the V-Ray proxy and also the actual method of importing it onto your scene. Painting Futuristic Cities by Robh Ruppel – Take a sneaky peak into the first chapter of one of 3DTotal’s groundbreaking eBooks in this short sample tutorial. 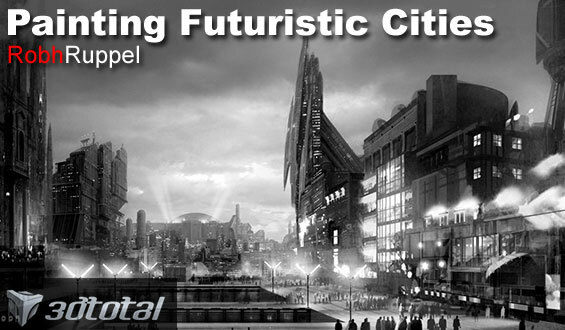 Concept artist Robh Ruppel shows you how to produce a stunning black and white futuristic city image using Photoshop and some of his neat tips and tricks. Check out our Spotlight Article and interview with Robh Ruppel to learn more about this dynamic artist. 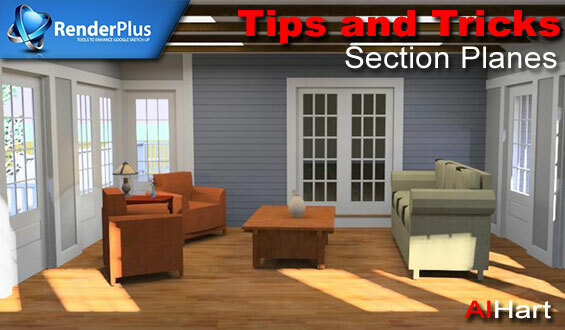 Tip of the Week – Section Planes by Al Hart – This weeks tip from Al is pretty cool and simple if your renderer supports Section Planes. With the wall removed it allows for for better camera positioning, and allows shadows, illumination and reflection. This subsequently means the room will be lit accurately. 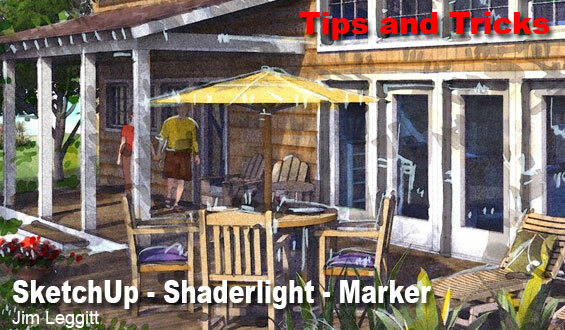 How to create a sketchy shadow using SketchUp & Photoshop by SketchUp Tips – A nice little tip by the SketchUp Tips blog on making hand made looking hatch shadows for your SketchUp presentations. Be different! Render Tip – Realistic Water Effects by Al Hart – Adding special effects such as Bump maps to water material is a great way to add realism because Bump maps add depth and detail to materials. 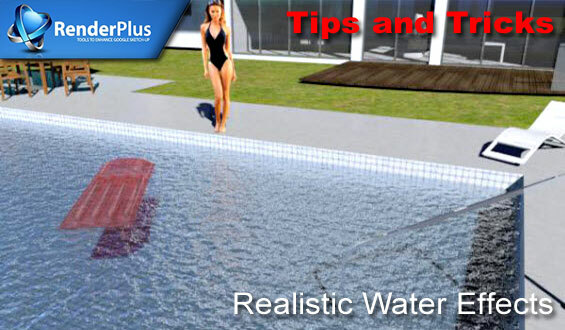 In the case of this model, the bump maps add the ripples on top of the water we are all use to seeing on any body of water like a lake or a pool. 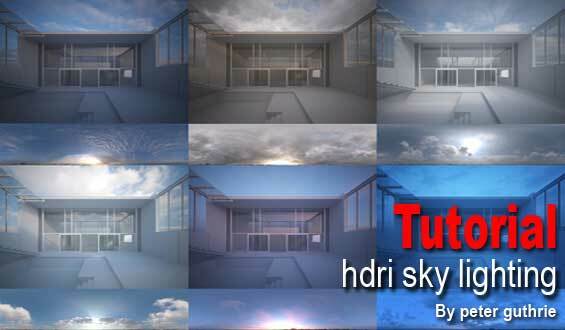 Render Tip – HDRi Skies by Al Hart – HDRi skies are a great way to improve any scene you are rendering. It is a quick and accurate way to give the user a high quality background image and illuminate the scene using the HDRi light intensity and colors. 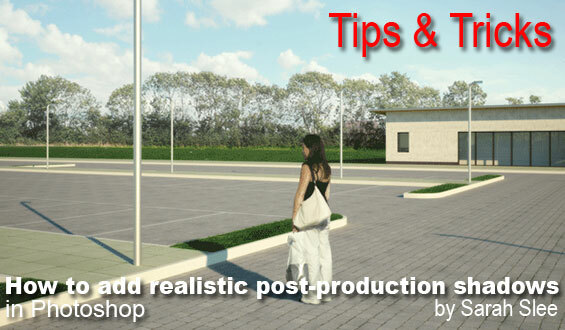 Al Hart of RenderPlus shows us the advantages of using HDRi skies to create better renderings. 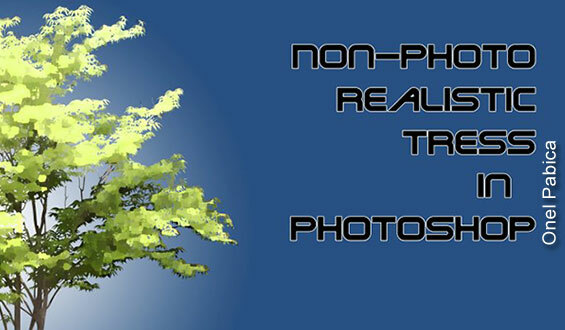 NPR Trees in Photoshop by Onel Pabico – In this tutorial, Onel Pabico shows us how to create non-photo realistic trees in Photoshop and create an action for this process so you can use it again and again, speeding up your work process. Very useful! 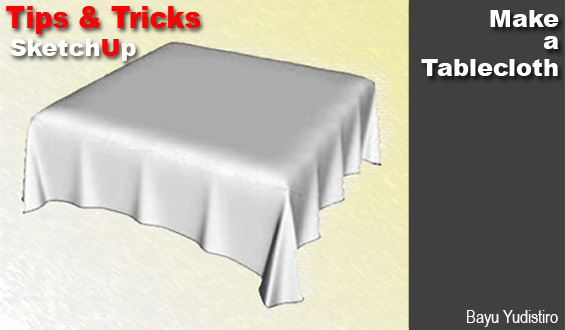 Make a Tablecloth in SketchUp by Bayu Yudistiro – In this mini tutorial Bayu Yudistiro shows you how to model a 3D tablecloth using SketchUp and Dale Marten’s very useful organic modeling plugin ‘SubdivideAndSmooth’. How to add realistic post-production shadows in Photoshop by Sarah Slee – Sarah Slee shows you how to add shadows to your 2D content in three simple steps. She shows you how to make your shadows look more convincing. 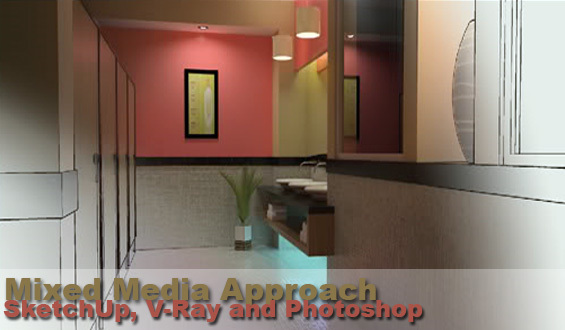 Raw Rendered Image Composition in Photoshop by Onel Pabico – Interior Designer and 3D Visualizer Onel Pabico shows us how to take a raw rendered output image from 3DS Max and with a few simple steps in Photoshop help make it pop! 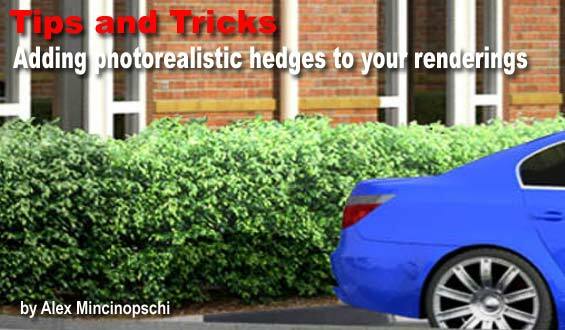 Adding Photo-realistic Hedges to Your Renderings by Alex Mincinopschi – Some more great tips from Alex Mincinopschi. He gives us an insight into his workflow in overcoming some of the problems and his way of achieving some convincing results. 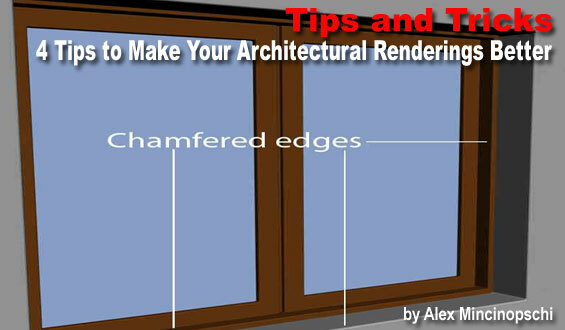 4 Tips to Make Your Architectural Renderings Better by Alex Mincinopschi – This is a small list of things that Alex considers important when doing architectural visualization (or any other subject, as long as it is supposed to be a photo-realistic rendering), and from what he sees in the image galleries, a lot of people don’t seem to care about. 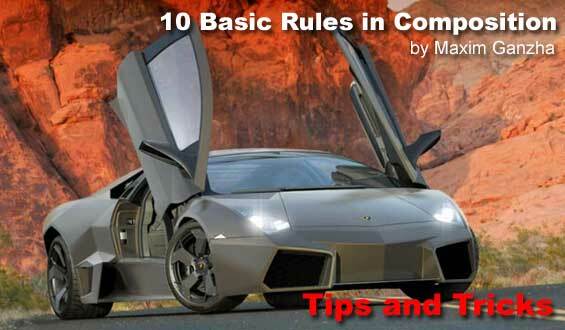 10 Basic Rules in Composition by Maxim Ganzha – These tips will certainly help to make your images more successful and visually appealing. 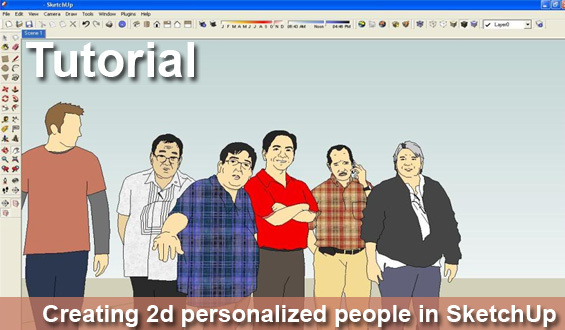 Creating 2D Personalized People in SketchUp by Vivisik of CgPnoy – How to make your own personalized 2D people using Autocad and SketchUp (Autocad not necessary). 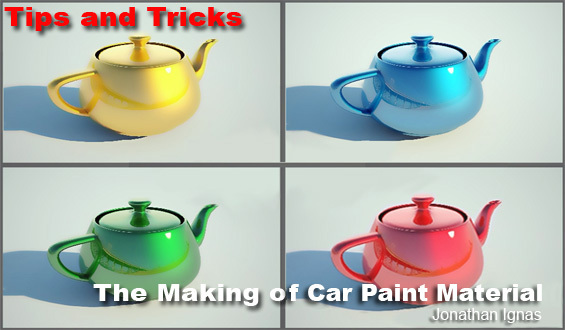 The Making of Car Paint Material: V-Ray for SketchUp by Jonathan Pagaduan Ignas – Get your car paint right with V-Ray for SketchUp. Jonathan Ignas shows us his settings. 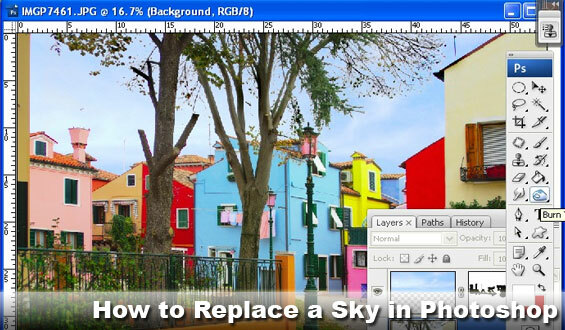 How to Replace a Sky in Photoshop by Helen Bradley – The method Helen uses involves the Blend tool because it avoids the need to make a detailed selection around the area of sky to replace. This is particularly handy if the skyline has trees or other wispy elements along it. 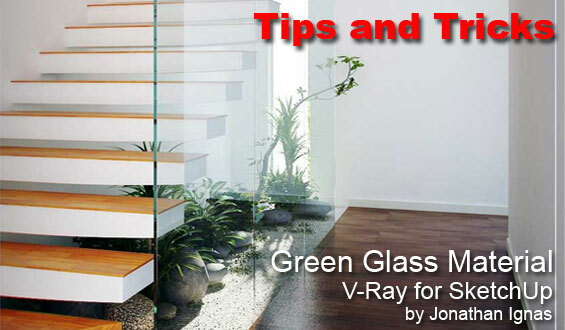 Green Glass Material V-Ray for SketchUp by Jonathan Pagaduan Ignas – You know sometimes when you look at glass it has a nice slight green tint to it. 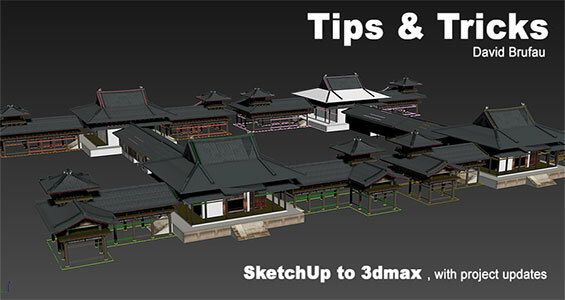 Jonathan shows you how achieve this common effect with his material settings in V-Ray for SketchUp. SketchUp+Shaderlight+Marker=Hybrid Watercolor! 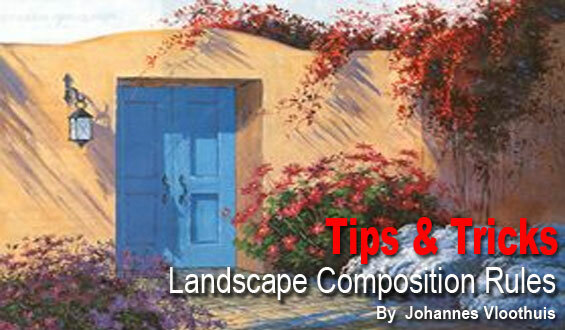 by Jim Leggitt – Jim works his magic again with this step-by-step exercise with the exploration of layering different visual elements together to achieve an amazing hybrid watercolor effect. 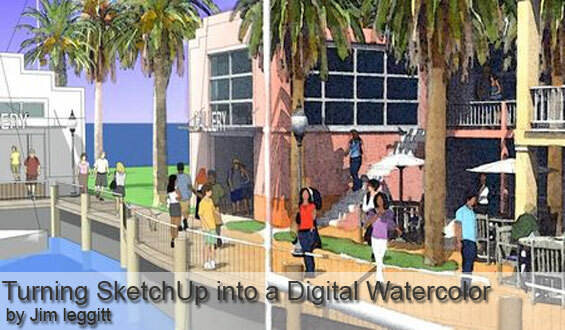 Turning SketchUp into a Digital Watercolor! by Jim Leggitt – This digital effect is as close to traditional watercolor as Jim has ever accomplished. Jim uses SketchUp, Shaderlight (SketchUp plugin), hand coloring with Chartpak AD markers and Photoshop filters to achieve this convincing artistic effect. 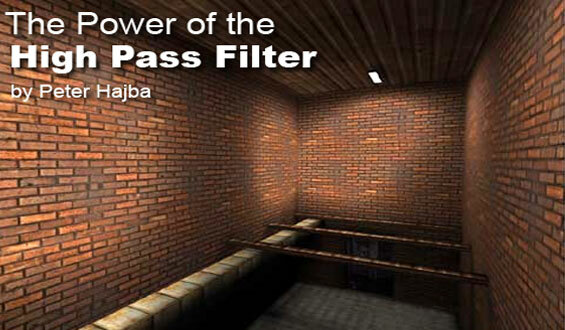 The Power of the High Pass Filter by Peter Hajba – These tips will explain the use of the often overlooked High Pass Filter in Photoshop. 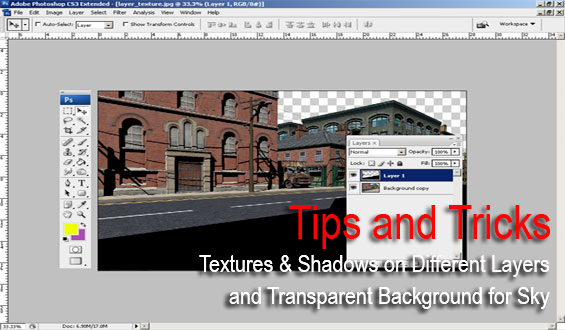 Get the best out of your textures! 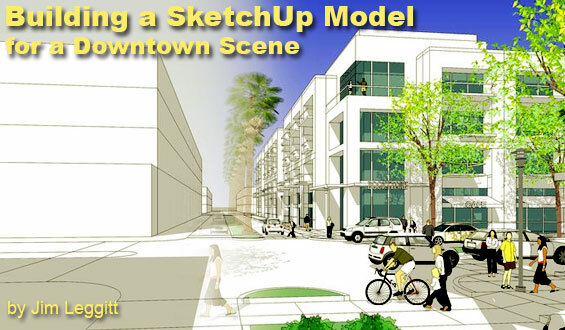 Building a SketchUp Model for a Downtown Scene by Jim Leggitt – In this tutorial, Jim explains his methodology and workflow in constructing a detailed SketchUp model with a active urban downtown setting. Where would you start? 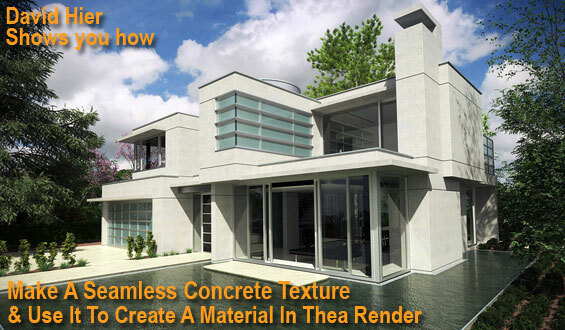 How to Make a Seamless Concrete Texture & Use it to Create a Material in Thea Render by David Hier – In this tutorial David Hier details the methods he uses to create a concrete material. 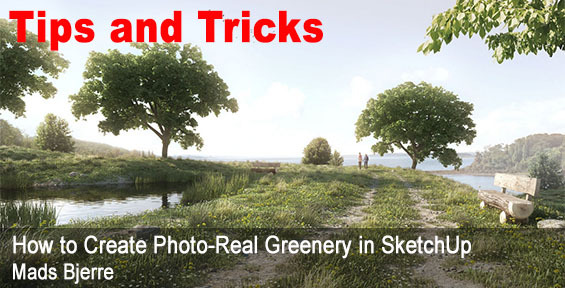 David uses Photoshop and Thea Render for this tutorial, but you can use other image editing software to achieve the same results. 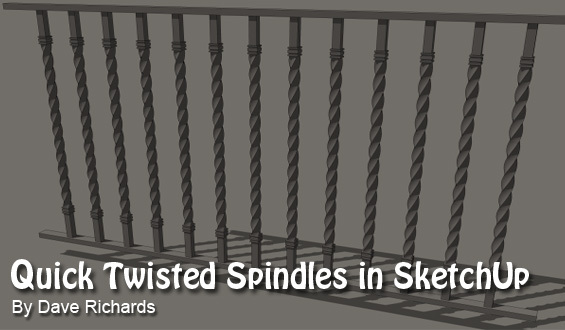 A Little Iron Work – Some Quick Twisted Spindles by Dave Richards – Dave Richards show us more of his tips and tricks and modeling with SketchUp. In this great tutorial, recently posted at FineWoodWorking.com, Dave shows us how to draw twisted iron spindles using SketchUp and a few of very useful plugins to help speed up and simplify the whole process. Don’t forget that Dave is also our resident Styles Guru, see some of his collection in our Styles section. 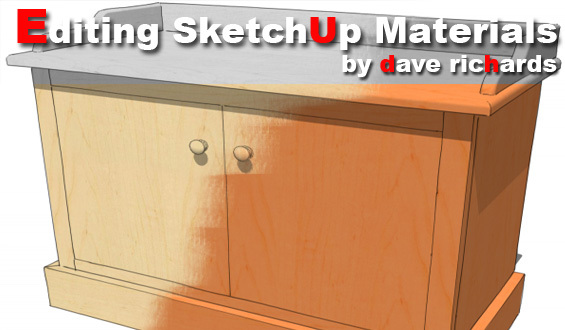 Editing SketchUp Materials by Dave Richards – This nice simple tutorial was recently posted on FineWoodWorking.com by Dave. 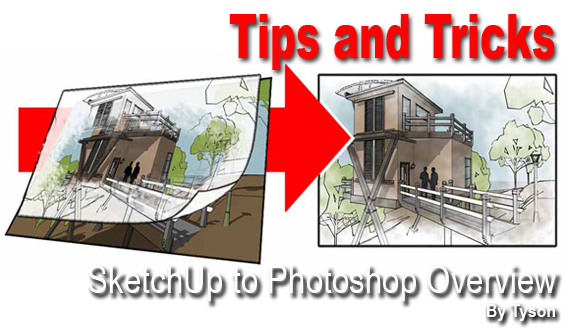 It shows you how to edit your materials in SketchUp with editing software while working within SketchUp. Very handy for speeding up your workflow! There is another one here done by Nomer Adona for us on using image editing software inside SketchUp. 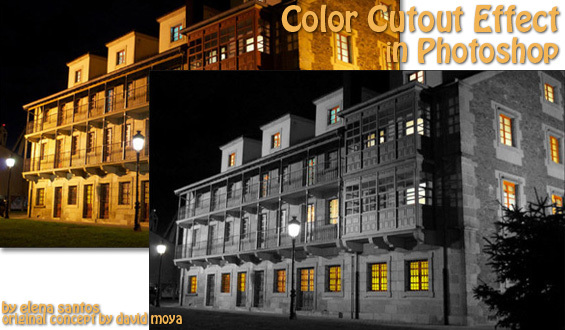 How to: apply a color cut out effect in Photoshop by Elena Santos – An interesting color effect added to a black and white image. This simple effect is often used to draw attention to certain areas in an image, and it’s really easy to apply. Elena shows you how with a few simple steps. Original tutorial by David Moya was in Portuguese and Elena has done her version in English. 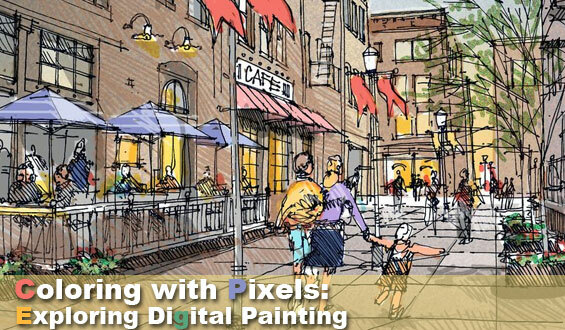 Coloring with Pixels: Exploring Digital Painting by Jim Leggitt – A valid visualization technique to learn to produce a series of digital coloring studies. Jim shows you how. 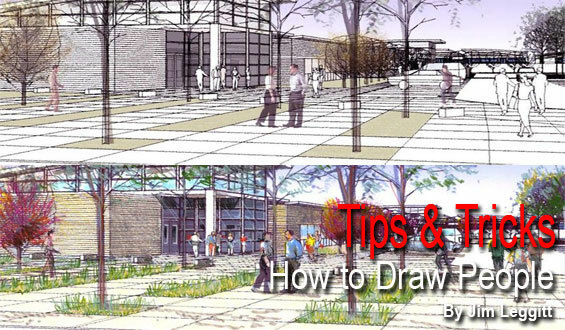 Mixed Media Approach – SketchUp, V-Ray and Photoshop by Nomer Adona – Here is a handy tutorial with plenty tips on how to use the different styles in SketchUp and then merging them with a rendered image in Photoshop. This creates what is called “digital mixed media”. 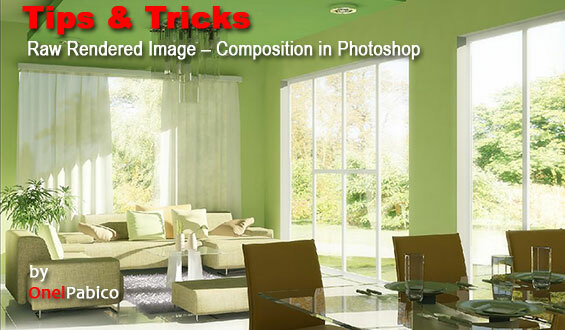 Most of this effect is created in Photoshop, but the aim here is how to explore different styles in Photoshop. We like this one! 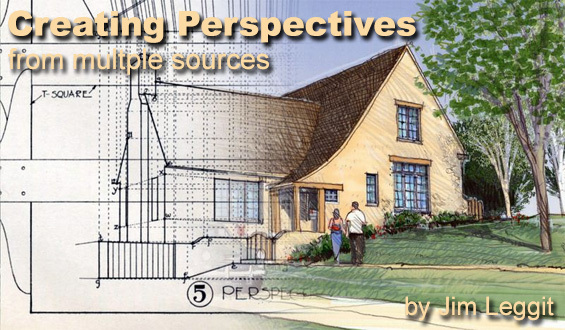 Creating Perspectives from Multiple Sources by Jim Leggit – Jim’s latest tips on how to create perspectives simply by using three techniques to arrive at the same perspective conclusion with incredible accuracy. Jim always makes it look so easy! 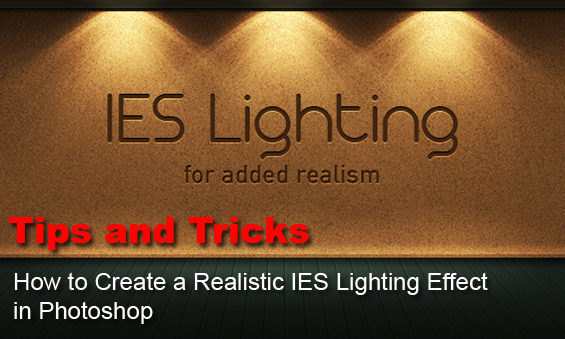 How to Create a Realistic IES Lighting Effect in Photoshop by Kieth Sereby – Learn how to create a realistic IES (photometric) lighting effect, using Photoshop CS4 as well as some free plugins and software. 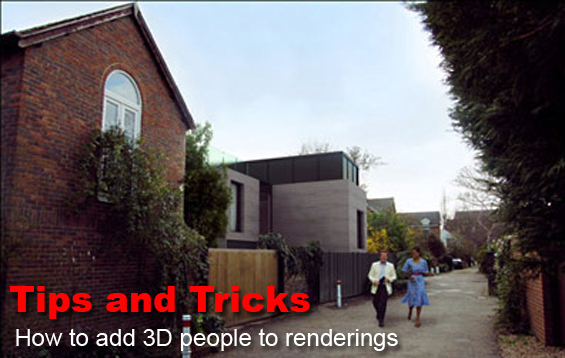 How to Add People to 3D Renderings by cgdigest.com – Blend people into your renderings and make it look more convincing using these tips. 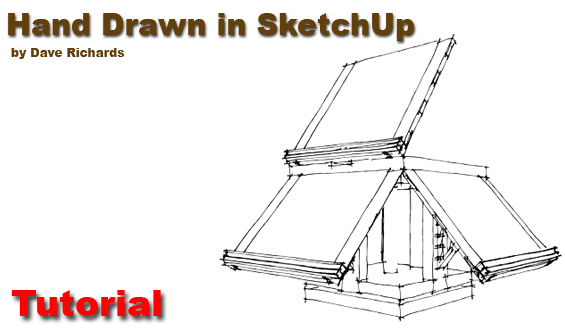 Hand Drawn in SketchUp by Dave Richards – Dave shows you how to create your own sketchy SketchUp Style using Style Builder. This tutorial was posted by Dave on the finewoodworking.com website. 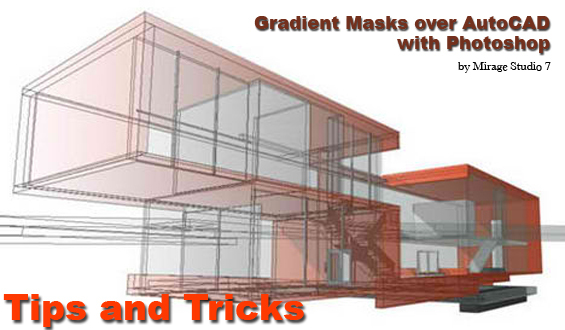 Gradient Masks over AutoCAD with Photoshop by Mirage Studio 7 – Add a Gradient Mask to your CAD drawing using Photoshop. 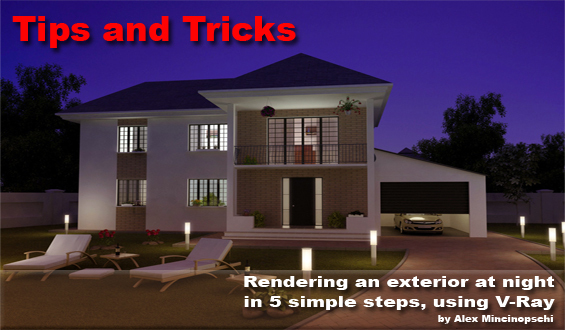 Rendering an Exterior at Night in 5 Simple Steps, Using V-Ray by Alex Mincinopschi – In this tutorial Alex goes through the 5 basic steps he uses when he does an exterior night-rendering using V-Ray. 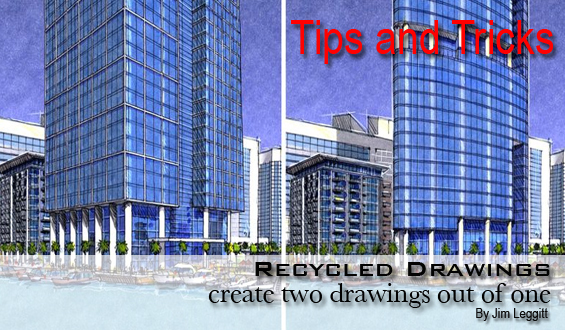 Recycled Drawings: Create Two Drawings out of One by Jim Leggitt – Once again great time saving tips and tricks from professional SketchUp artist Jim Leggitt. As is often the case you may have a project where the client is considering a few different design possibilities, this is one way to save a lot of time and frustration while achieving great results and making your visualization process more efficient. 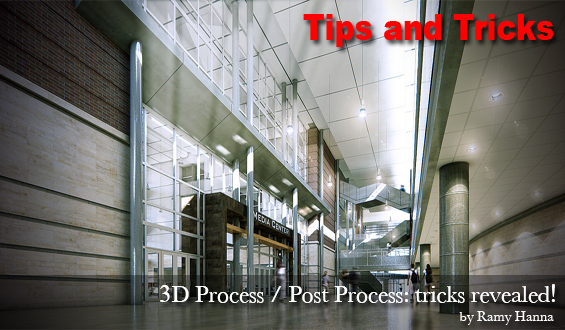 3D Process/Post Process: tricks revealed! by Ramy Hanna – 3D Artist, Ramy Hanna shows you his post process technique using a SketchUp model, the latest version of 3DS Max 2011 and Photoshop. 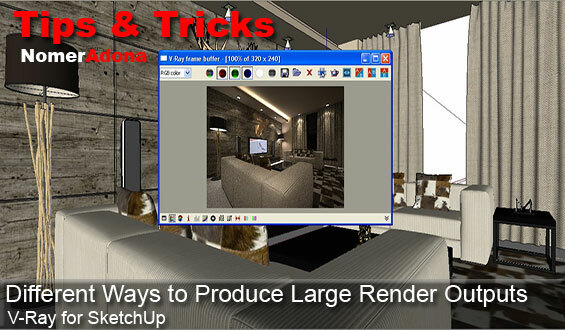 If you wanted to get your model from SketchUp into 3ds Max with versions before Max 2010, you would need the Pro version of SketchUp to export your 3d model into either a .3ds or .obj file from SketchUp and then import it into Max. Now the latest versions of Max import the SketchUp file straight into Max, thus meaning users can now use the free version of SketchUp, in this workflow. Painting Clouds by Steven Stahlberg – Stahlberg is most certainly a forerunner in 3D character modelling. Steven Stahlberg is one of those professional 3D artists who has put his stamp on the digital world and especially that of 3D models. 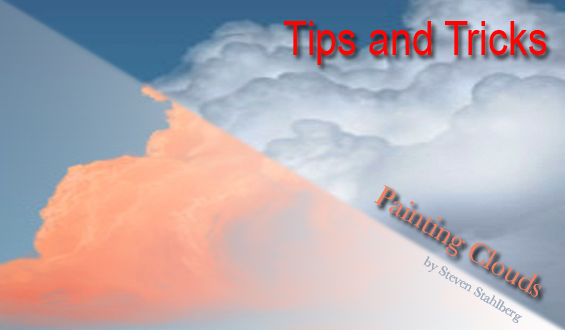 In this short tutorial Steven shows you how to digitally paint your own unique clouds with Photoshop though any paint program will do the same job. 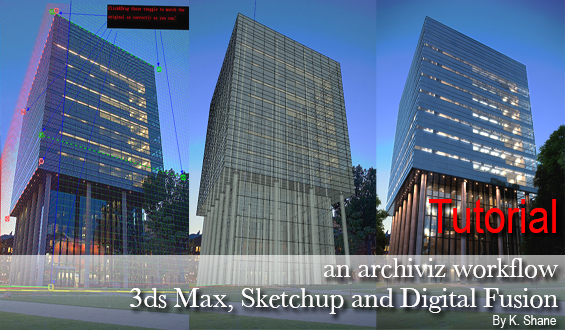 An Archiviz Workflow Overview – 3ds Max, SketchUp and Digital Fusion by K. Shane – In this advanced architectural visualization tutorial, published over at cg tuts, you will use SketchUp for photo matching, create a V-Ray proxy in 3ds Max and use Max script to help speed up your workflow. Then you will reduce render times when creating a large scene, set render layers in 3ds Max and do some post production in Digital Fusion. Plenty for everyone! 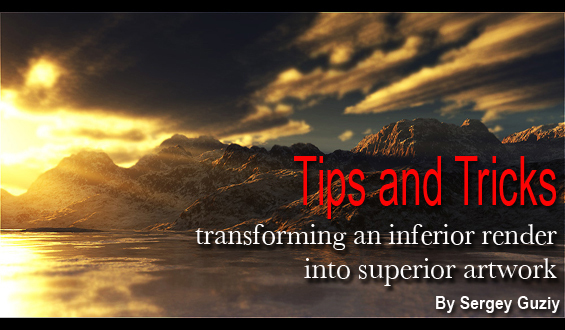 Transforming an Inferior Render Into Superior Artwork by Sergey Guziy – This is a Photoshop tutorial by Sergey that will teach you how to transform a desaturated render into a great image that will look phenomenal when compared to it’s original counterpart. 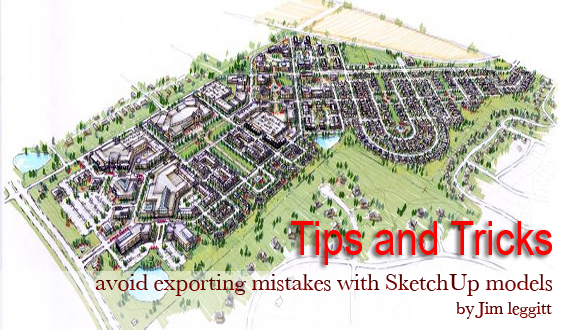 Avoid Exporting Mistakes with SketchUp Models by Jim Leggitt – Jim explains the pitfalls and how to avoid them by setting your model up correctly before exporting it. Some very useful tips in this little study. This is a real gem and will further enhance your skills. 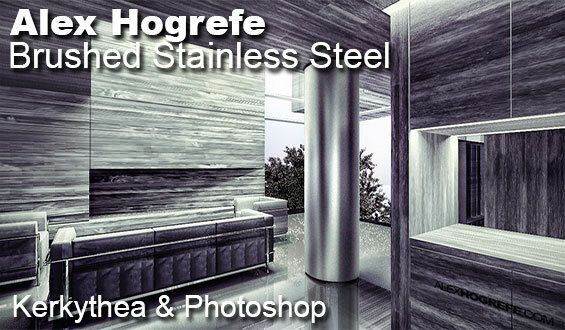 Textures and Shadows on Different Layers and a Transparent Background for Sky by Studio Mugenjohncel – Good little tutorial using SketchUp, 3D Warehouse and Photoshop. 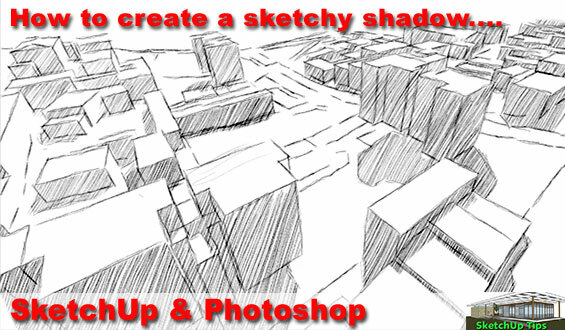 By exporting different 2D images from SketchUp into Photoshop, you can have your textures and shadows on different layers and have a transparent background for you to put your sky into. Handy! How to Draw People – three simple tips by Jim Leggitt – If you cannot draw a figure from imagination, trace it from a photograph, recycle a figure from a previous drawing or incorporate a computer generated figure. I have a collection of figures from SketchUp that I commonly use to trace from. 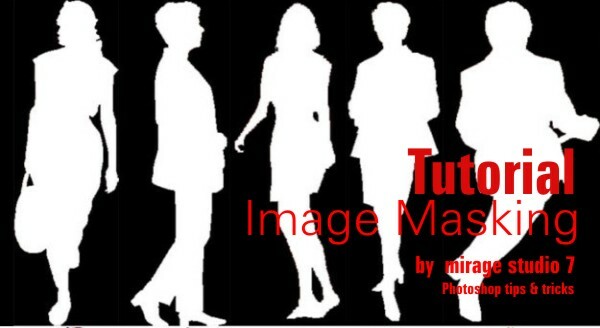 Take digital photos of people in a shopping mall or a retail street and begin your own collection of people images to trace from. Basic Principles of Digital Matte Painting by Daniel Johnson – Digital Matte Painting is a huge creative field that can add wonder and excitement to static film shots. 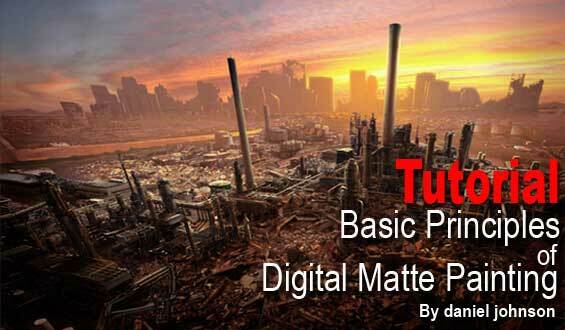 Learn about digital matte painting principles, like set extension, camera mapping, as well as professional tips that matte painters employ. See this brief overview of the process. 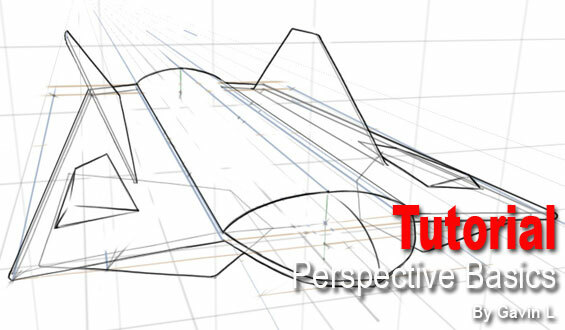 Perspective Basics: A Draw Through Technique by Gavin L – Want to learn some basic perspective drawing skills? Gavin states ” Be it for a design, illustration or just for leisure, you can use this new technique to assist you with your work. If you were trying to communicate designs quickly it wouldn’t be realistic to try and incorporate this technique perfectly every time. But I hope that learning this may improve your overall work flow where you need it ” We will all learn something from this great tutorial. Create Stunning 3D Text Free with SketchUp by Joshua Johnson – A great little tutorial on how to create awesome 3D text with SketchUp and Photoshop. 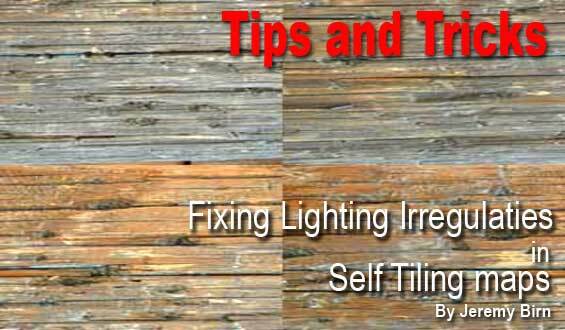 Fixing Lighting Irregularities in Self Tiling Maps by Jeremy Birn – If you get color and lighting shifts running across your original image, this tutorial shows how to get rid of overall color and brightness shifts before making a tiling map. 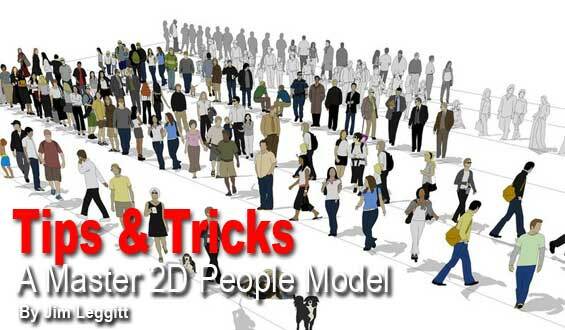 SketchUp Shortcut: A Master 2D People Model by Jim Leggitt – Have you ever been bogged down locating and inserting 2D people into a SketchUp model? If you don’t have well organized component files and are spending way too much time trying to find 2D people on 3D Warehouse, then there is an easy solution for you. This nice working idea by Jim Leggitt will get you organized! Carpet Tutorial – V-Ray for SketchUp by Eric – Nice little tutorial by Eric on applying material and bump map to produce some nice carpet! 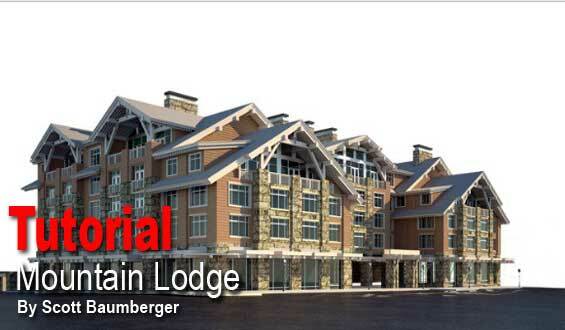 Digital Watercolor Architectural Rendering in Photoshop by Scott Baumberger – ‘Mountain Lodge’ is a step by step guide to making a digital watercolor rendering in PhotoShop. This model was built in SketchUp and AutoCad and all files were then compiled in one model file in 3D Studio Max for rendering. Scott has a great technique and eye for detail. Don’t miss this one! 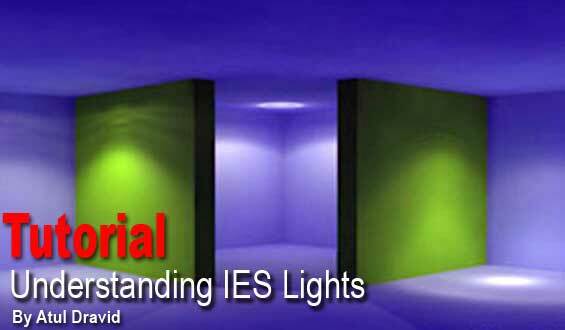 Understanding IES Lights by Atul Dravid – This tutorial will teach you how to use IES files in your scenes. You need to have a basic understanding of 3ds max work-flow and at least one IES file with you to complete this tutorial. HDRi Sky Lighting Tutorial by Peter Guthrie – A quick tutorial on how to use HDRi Skydomes by Peter Guthrie. Peter is a freelance visualization artist based in Falun, Sweden. 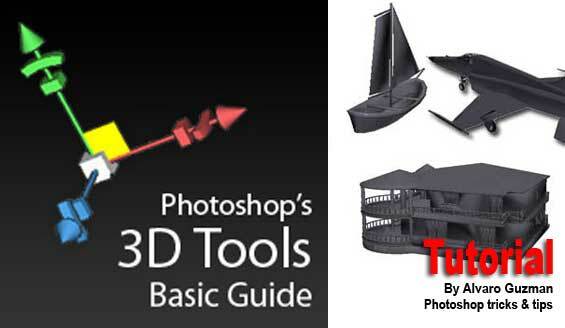 Guide to Photoshop’s 3D Tools by Alvaro Guzman – Alvaro Guzman shows you how to open a 3D file to rotating, scaling and moving it, working with meshes, creating textures or even materials, adding lights, and more. 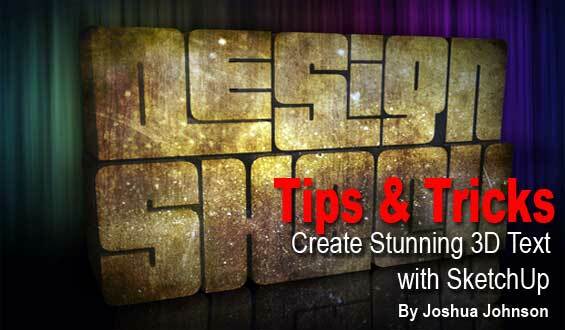 This tutorial covers most of the secrets of the useful feature 3D Tools of Photoshop CS4 Extended. If you have it, why don’t you try? I can assure you that you will discover a brand new world of infinite possibilities. 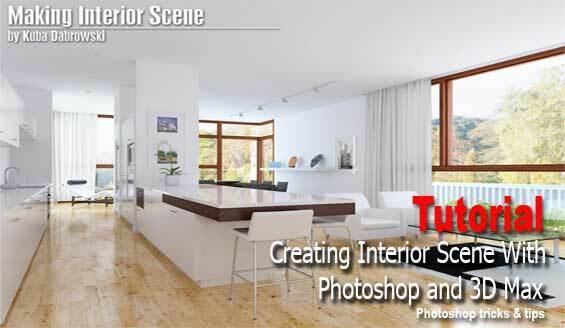 Making an Interior Scene by Kuba Dabrowski – In this tutorial I will show you how to create a simple interior scene based on a reference photo, using 3D Studio Max. I wanted to make it basic and simple for beginners without any complicated advanced settings. 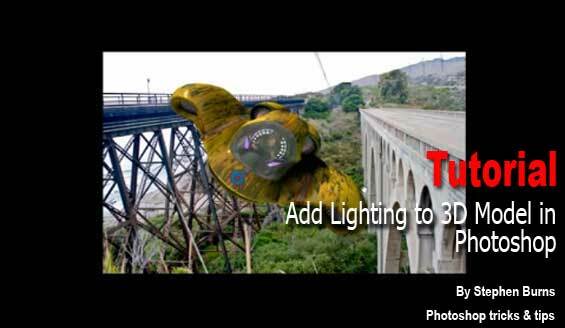 Add Lighting to 3D Model in Photoshop by Stephen Burns – Stephen Burns uses Photoshop to apply 3D lighting to a model and the photographic background that he has added behind it. There are three other parts in this series. 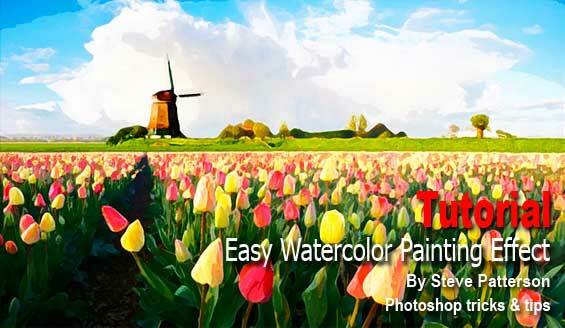 Easy Watercolor Painting Effect – In Photoshop by Steve Patterson – In this Photoshop tutorial Steve Patterson shows us how to make an image look more like a watercolor painting. This effect works best on images where maintaining rich colors and strong contrast is more important than keeping any fine details, since you will be losing a lot of detail with this effect. 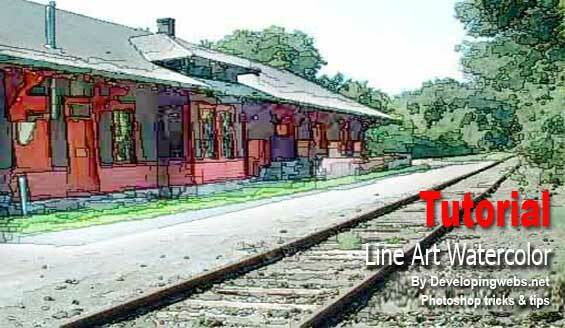 Line Art Watercolor Tip – Using Filter/ Blending Options by Developingwebs.net – A quick and simple technique to achieve a simple line art watercolor effect using a Filter and Blending option in Photoshop. You can adjust the options to suit your own needs and achieve different results. Experiment! 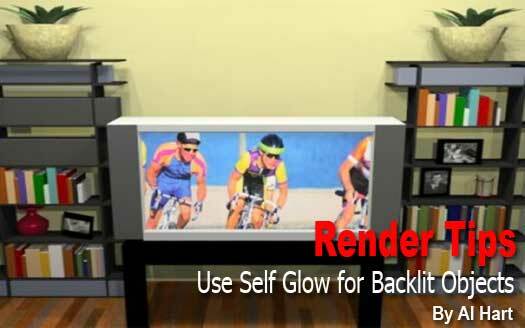 Render Tip – Use Self Glow for Backlit Objects by Al Hart – Self Glow illuminates a surface as if it had light shining on it, without actually making it a light. For objects which you want to appear bright, but which don’t need to illuminate other objects, this is much faster than making lights out of them. 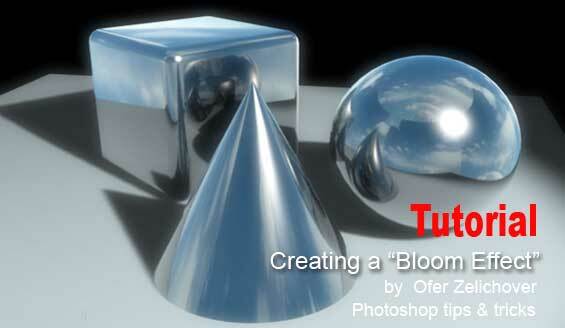 Creating a “Bloom Effect” by Ofer Zelichover – This great little tutorial by Ofer Zelichover describes how to create a “bloom” effect. A bloom effect makes the image look brighter and have a “hazy” look to it. Creating this effect is very simple, and is done as a post render process. 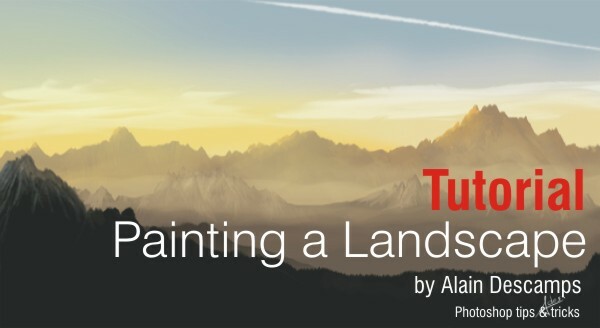 Painting a Landscape by Alain Descamps – CGArena published a detailed step-by-step tutorial on how to paint a landscape with the digital painting and editing software Photoshop. Alain Descamps, the tutorial’s french author, shows us how by illustrating his technique. 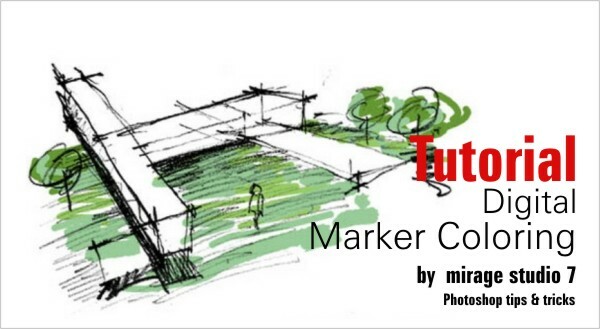 Digital Marker Coloring by mirage studio 7 – Color your sketches digitally with Photoshop. I’m not going to show you how to use marker pens to color your sketches using the conventional way, its going to be the digitally done using PhotoShop instead. The image below is an example of a digitally colored sketch using PhotoShop. The best part is you are able to undo your mistakes! Adobe Photoshop CS2 – Image Masking by mirage studio 7 – When it comes to presentation, inserting raster images of human and trees gives it an overall feeling of liveliness. The whole idea is to counter the mono tone feeling of line drawings, especially when it comes to presenting your work to someone who is not in the field of architecture. 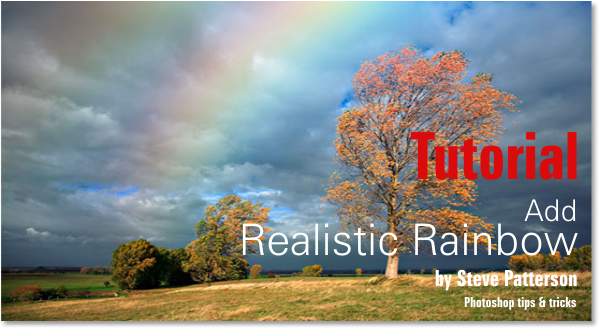 Add Realistic Rainbow by Chris Patterson – In this Photoshop photo effects tutorial we’re going to learn how to easily add a rainbow, even a double rainbow, to a photo. Of course as with most photo effects, it helps if you start with the right type of image. Adding Sunlight Through The Trees by Steve Patterson – In this tutorial we’re going to learn how to add beams of sunlight through trees, which is not only a great way to make an image look more interesting, it’s also a lot easier to do than you might think, as we’ll see. 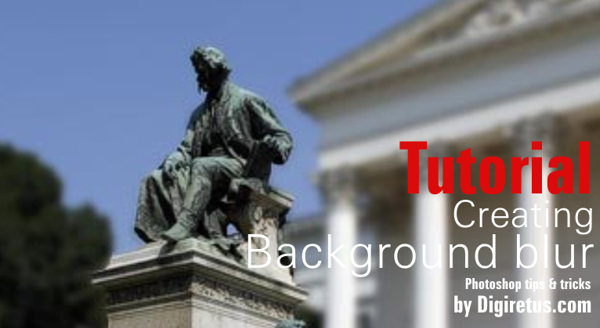 Creating Background Blur by Digiretus.com – An aesthetic trick often used in photography is the emphasis of the main theme against other areas of the picture by using a small depth of focus. An object or a face can spectacularly stand out against a blurred, homogeneous background. Thanks for republishing my different blog posts on visualization! I appreciate you spreading the word to other creative individuals that there are many new and impressive digital and traditional tools we as designers can use to communicate our ideas. Thanks! Just noticed that the Import SketchUp to 3DS Max tutorial link seems to be broken on this page at the moment. We will take a look at your suggestion and see what we can come up with in the coming months. Thanks for dropping by! Hi! I would like to use an image as a backgroud in sketchup just like the tutorial on this page but, when i render it with maxwell the image doesn’t appear. I don’t wanna use some complex HDR images… Do you have any suggestion? what I am looking for is a porgram that I can flatten autocad drawings without a lot of steps. Our drawings use paper space with viewports, the average is 1 viewport but we can have up 6 viewports and can also be clipped. The Bentley flattener only works 70% of the time. Easy Cad to many steps invloved. I have tried importing a 2007 acad dwg, set parallel projection, set top view, export to 2d graphic, save drawing, re-open drawing. this dose not work. in my vray rendering vegetation comes dark leaf,why? @Pia glad to have your work here ! (Continued from above) in Charleston, SC. I have 18 years experience in the landscape design/build industry. I’ve worked for and with some of the most renowned LAs in the Southeast. But I’ve gotten to the point in which I want to start my own venture and fill a niche within my local industry. There is a lack of LAs and designers here that have the skills and knowledge to produce 3d models and animations. For the last 2 months I’ve been dedicating all my time in learning SU. While studying LA at Clemson over 9 years ago, we touched on the very basics of SU because I don’t think anyone knew at that timethat it would become the staple in design that it is today. I want to contract 3d design services to many of the companies in the area. I’ve been trying to find a way to create architectural visualization renderings for residential landscape designs. It’s been tough because all of the tutorials and research that I’ve found are more tailored to urban scenes and modern architecture houses. I feel that is easier to make this modern architecture pop more from a visualization point of view. Materials likemodern like glass,wood, metal and synthetics seem to work better when creating a rendering. I haven’t been able to create even descent photorealistic rendering with the more historical and traditional architecture that is a huge part of the Charleston area. I’m an autocad guru that can offer design and drafting services to many of my friends in the industry. I just want to be able to add rendering services that can set me apart from competition. I’m just having a tough time creating awesome renderings without the modern architecture and materials. I can’t afford a rendering engine at this point. But I do have autocad in which I’m proficient, SU which I’m able to model almost anything. Now it’s just a matter of speeding up my workflow. I also have Photoshop CS6 which I’m learning different ways of rendering. Does anyone have any advice or can steer me in a direction that could help me develop a rendering workflow using cad, su and ps only. Any suggestions or help would be greatly appreciated. Thanks to everyone and is a pleasure to be part of such an amazing community. David , i think it would be best to post your question in our Facebook Group. There are 1000’s of people there who would certainly help you out with this. They use many workflows and I sure they will give you some good ideas.